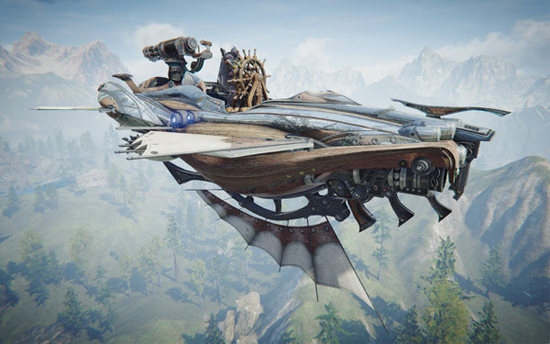 After a successful show at G-Star 2017, Ascent: Infinite Realm developer Bluehole has released in-depth information about airships, the main transportation system in the game, and the weapons they hold. A:IR is an online MMORPG based in a steampunk world. After their home on Harth was destroyed, the inhabitants had nowhere to turn but up, and so they took to the sky. Players need the airships in order to explore the new floating lands and support the survival and reconstruction of the faction. Airships are the main means of transportation and players increase in power by using them to fight against opponents. Nous Training Airship - The Nous Training Airship is a beginner airship that can only be used by the Nous. It is obtained through quests, suitable for a single player, and has a low flight altitude. Ontari Training Airship - The Ontari Training Ship is much the same as the Nous airship, except it can be crafted. The Intermediate version can be equipped with a turret and rudder upgrade, allowing for faster movement and turning speed, as well as a slightly higher altitude. The Master Ship adds wing appearance slots and comes in vastly different colors than the Intermediate or Training versions. Vulpin Airship - The Vulpin Airship functions in the same manner as the Ontari but differs greatly in appearance. Where Ontari Airships have wings on the side and bottom of the vessel, Vulpin airships are characterized by the rear wings and color variations. Single Vulpin / Ontari Assault Airship - The Single Assault Airship is a personal airship only available on the battlefield. It can be manned by up to two players: one piloting and the other operating the weaponry. There is no limit on its altitude. Its fundamental performance is equivalent to the Intermediate Airships, though it can achieve rapid movement in straight lines. Multi-Passenger Vulpin / Ontari Assault Airship - The Multi-Passenger Assault Airship is only available on the battlefield and can accommodate up to five players. This airship is large in size, with powerful attacks and high defense. However, it is slow moving and does not turn quickly. Not only does this make it vulnerable to attack, but its strategic importance to battle also makes it a prime target for assault. To counteract this, players must guard the driver and engage enemies on the deck of the airship. Wind Sprinter - The Wind Sprinter is a non-combat racing ship with rapid movement speed and a high flying altitude. This ship is acquired at end game and can be used during World Quests. Black Ship / Merchant Ship - The Black Ship is a special merchant ship that can only be used in specific instanced dungeons. Little more is known about this vessel currently; its origin is veiled in shadows. The Merchant Airship is a non-combat vessel, intended to help players explore the world and trade any specialties they might come across. Large-Scale Ship - The Large-Scale Ship is a massive airship, capable of carrying 75 players, and acts as a transfer vessel to carry attacking players into the battlefield at Dragon Valley. The ship contains a large number of flying mounts and cannons, making it quite intimidating for enemies to approach. Mechs - On the Battlefield of Dragon Valley, you can catch your first sight of ground-based weaponry as mighty Mechs engage the enemy. In front, Flame Mechs spray jets of fire, while Assault Mechs bombard the foe from the rear. These machines, known as Vulcans, can be used for exploration and assault in hazardous regions, such as the Ship’s Graveyard, with attacks such as Machine-gun Fire and Flame Blasts. The use of enhancements can also increase the power of these attacks, helping to guarantee your safety in the most unforgiving of areas. Boardable Machine Gun - A Boardable Machine Gun can be mounted on airships and may only be used by allies in order to barrage enemies with a hail of bullets. This type of weapon relies on speed over bulk damage, firing continuously to shower enemies in a hail of bullets. Boardable Cannon - A Boardable Cannon can be mounted on airships and may only be used by allies. This weapon launches a large projectile at enemy forces. This type of weapon utilizes large, high damage attacks, which of course will deal higher damage per hit than its Machine Gun counterpart with superior firing velocity. Boardable Flame Cannon - The Boardable Flame Cannon can be mounted on airships, and may only be used by an ally. This weapon shoots blasts of flames at enemies. Automatic Machine Gun - The Automatic Machine Gun operates similarly to the Boardable version and releases multiple bullets in large bursts. However, it automatically fires on a target set by the Ship’s pilot. Turret - A turret is an automatic gun that can be mounted on airships and will use curved projectiles to automatically attack a target designated by the Ship’s Captain. For more information about A:IR, visit the new teaser website to sign up for the newsletter and get a chance to participate in future Beta tests. Follow A:IR on Facebook and Twitter for the latest news and updates.